The Astros’ quest for a repeat has entered its final act, facing off with the Indians in one half of the American League Division Series on Friday (2:05 p.m. ET, TBS). In a battle between the last two AL World Series reps, Houston finished the regular season with a franchise-record 103 wins, going 4-3 against Cleveland. The Indians (91-71) send two-time Cy Young winner Corey Kluber to the mound to try and steal Game 1 in Houston. The Indians took advantage of a weak AL Central this season, and finished the season just 14-14 in September. But Cleveland still boasts two of the best players in baseball, with Francisco Lindor and Jose Ramirez combining for arguably the best overall offensive threat and defensive left side of the infield. The Astros, home at Minute Maid Park, send Justin Verlander to the hill in Game 1. Verlander finished the season red hot, pitching to a 1.09 ERA in September (five starts, 33 innings) after a rough August. 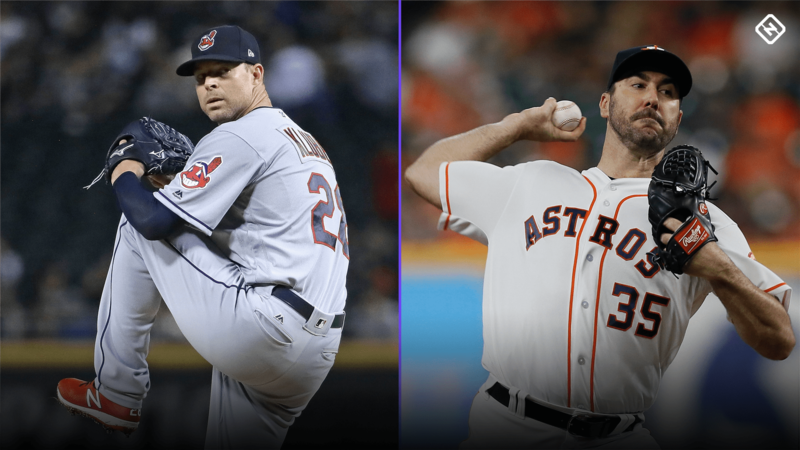 Could it be the first step to an Astros repeat, or will the Indians give Houston a problem? 3:45 p.m.: Verlander picks up two more strike outs and the Indians go one, two, three as we head to the bottom of the fifth. 3:34 p.m.: End of the fourth inning. Kluber strikes out Martin Maldonado to end the inning. Astros lead 2-0. 3:31 p.m.: Astros scoring play. Reddick singles to left and to score Gurriel. White advances to third and the Astros now have runners on the corners with two outs. Astros lead 2-0. 3:28 p.m.: After González and Carlos Correa fly out, White singles up the middle and moves Gurriel to second. Reddick up with men on first and second and two outs. 3:19 p.m.: Kluber then walks Gurriel. González steps in with a runner on and nobody out. 3:15 p.m.: Astros home run. Bregman takes Kluber deep to left field on a solo homer to lead off the bottom of the inning. Astros lead 1-0. 3:11 p.m.: Verlander’s found a grove as the Indians go three up, three down again as we head to the bottom of the fourth. 3:02 p.m.: End of the third inning. The Astros go one, two, three and it’s on to the top of the fourth. Game tied 0-0. 2:55 p.m.: Verlander strikes out the side and we’ll head to the bottom of the third. 2:43 p.m.: End of the second inning. Kluber hits his second batter of the inning as Tyler White goes to first base. Josh Reddick then grounds into and inning-ending double play. Game tied 0-0. 2:38 p.m.: Kluber throws one inside and it seems to graze the jersey of Marwin González. Replay review determines it did and González is awarded first base. Runner on, nobody out for Houston. 2:33 p.m.: Three up, three down for Cleveland as we head to the bottom of the second. 2:26 p.m.: End of the first inning. Gurriel flies out to center stranding Bregman at first. Game tied 0-0. 2:24 p.m.: Alex Bregman draws a walk with two outs for the Astros as Yuli Gurriel steps in. 2:15 p.m.: José Ramírez draws a two-out walk, then Edwin Encarnación grounds into a fielder’s choice to end the top of the first. 2:08 p.m.: Verlander’s first pitch to Lindor is a strike and the game’s underway. 2:01 p.m.: They’re about to get underway in Houston. First pitch is moments away. If we’re going to accomplish the task at hand, it’s going to take more than 25. If we’re bringing this thing home, it’s going to take more than an organization. Winning 11 games in October is a tall task, and it’s going to take a city.